If you’ve never tried a bidet before, it can seem intimidating to install a unit or figure out how to use one for the first time. However, the benefits to senior users can be especially fantastic, as bidets make for more efficient, more thorough, and comfortable cleaning after using the commode. If you have used a bidet, but it was years ago, it’s likely you experienced an older, traditional style bidet. These are separate units from a toilet and can be tiring on the legs to hover over. Bidets have come a long way and can be fantastic for senior use. So, we’ve picked our favorite four bidets for seniors and aging individuals who want a modern, easy-to-use version of these hygiene devices. We like the affordable price, the dual spray option, and fantastic ratings, making this our favorite overall. Dual nozzles offer frontal and rear wash.
Nozzle guard gate ensures sanitary use. Accessible seller to contact for questions. Some reports of T connector leaking. Only connects to cold water. The Luxe Bidet Neo 185 is a versatile device with sanitary maintenance in mind. The hygienic nozzle automatically retracts and has a guard when not in use to keep it clean. This bidet also has a self-cleaning feature that sanitizes the sprayers, making it safer yet easier for elderly users to use without health concerns. It’s constructed with high-pressure valves, but also has the option for a softer, gentler cleaning spray on the frontal setting. The dual spray option design take women into consideration as well as men, and thus offers a gentler pressure. The Luxe Bidet Neo 185 attaches to any standard, two-piece toilet with convenient knobs just to your side when you need to use it. This Luxe Bidet Neo 185 does not have a hookup to hot water, so it will only use cold water. However, some consider this refreshing and also kinder on utility bills. If you’re looking for a front and rear option bidet, this is our overall favorite for the price, excellent ratings, adjustable pressure, and dual-spray options. We love this as a more basic model for seniors who only need one spray nozzle and want a decent price. Nozzle guard gate for sanitary use. Depending on toilet seat, maybe require bumpers. The Luxe Bidet Neo 120 is ideal for seniors who want a bidet but in a more straightforward style with only one retracting sprayer, as opposed to the dual-nozzle option on the Luxe Bidet Neo 185. However, this model still offers the self-cleaning feature of the spray head to ensure a sanitary, hygienic cleaning. This bidet has simple installation and a hose you can trim with a kitchen knife for the desired length. We like the adjustable pressure via the convenient knob right next to you when in use. Like the model before it, the Luxe Bidet Neo 120 lacks a hot water hookup, but users reported to favor the room temperature to cooler wash. Even with just one nozzle, there are two spray options—low and fan spray—for your comfort and desired cleanse. For seniors who have trouble wiping or reaching, or struggle with bathroom issues, this bidet is a bathroom blessing. This out-of-the-bowl mount and hand-held sprayer make this our favorite for seniors who want a super clean sprayer and hand-held control. Can be used to spray off clothing accidents. Nozzle is mounted outside of toilet bowl. Some reports of hose breaking down. 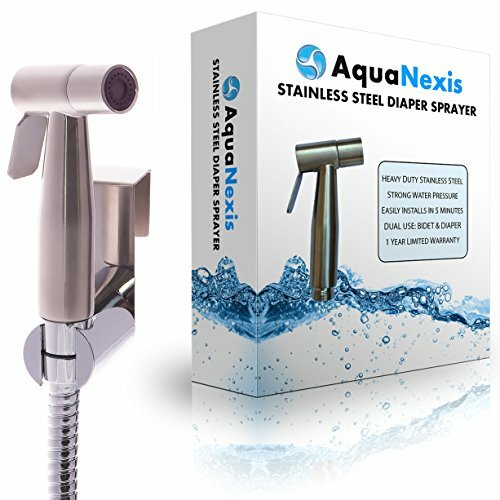 The Aqua Nexis Stainless Steel Sprayer is a hand held bidet sprayer that can be mounted either on the side of your toilet or on the wall next to it. This versatile piece of equipment is ideal if you’re looking for a hand-spraying bidet. This bidet sprayer has a tangle-free hose and 360-degree pivoting head to ensure proper aim. This results in more comfortable use for elderly with arthritis or other conditions that make dexterity difficult. The beauty of a hand-held spraying bidet is that you also have the option of front cleaning, rear cleaning, and even spraying off accidents in clothing if necessary. This is ideal for some caregivers or those elderly with bowel issues. The mounting of the nozzle itself outside of the toilet bowl is perfect for those particularly concerned about germs and keeping a bidet clean. So, we love this option for seniors who have a lower immune function or who worry about bidets and germs. 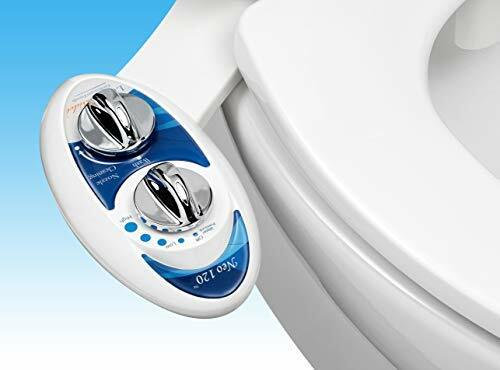 This is our favorite for a higher-end bidet with heated options and a drying function. Remote for ease of use. Dryer eliminates the need for paper. Comforting heated toilet seat built in. Not recommended to sit on closed lid. Seat tends to shift to the left. 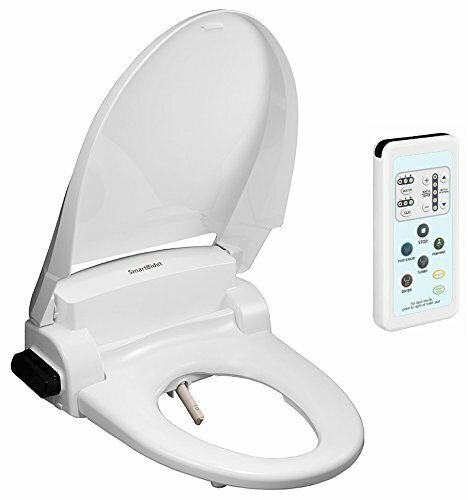 The SmartBidet SB-1000 Electric Bidet is an all-in-one bidet package built into a toilet seat. This higher-end model features a hot water hookup, so you have the option of a warm wash, as well as a dryer function. It comes in both elongated and standard round seat shapes. With a soft-closing lid, energy-saving mode, adjustable temperature, and remote control to operate with ease (and without having to twist to the side), this is luxury in a bidet. Better yet, it has a heated seat, as well. 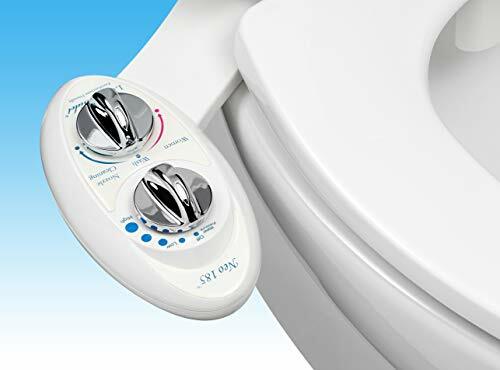 We love this electric bidet for seniors who are often cold and prefer a warm water option, or those who have trouble reaching around to adjust knobs. With the added drying feature, this bidet essentially eliminates your need for toilet paper—this can be a bonus for aging individuals with issues such as hemorrhoids. This unit does require two AA batteries, however, the auto-functions make it well worth an electric model in our opinion. The nozzle self-cleans both before and after use. Not only is the water pressure adjustable, but the position of the sprayer is, as well. Better yet, both the water and the air dryer have five settings of pressure and temperature. This offers seniors the option of a warm or cool dry. Eliminating the need to wipe can make a massive difference in the lives of people with mobility issues or for those who use a wheelchair. You might have heard about some of the higher-end brands of bidets such as Toto. However, there are fantastic options, as you can see, for much lower prices. The key is to look for quality and high user ratings in a bidet. You don’t want a leak flooding your bathroom, so keep the following in mind when buying a bidet. Something many people forget to think about until they go to use their bidet is whether it will have hot water hook up. This option will allow you to use warm water, rather than straight cold. If you’re a senior living in a hotter area such as Florida, Texas, or Arizona, this might not be an issue for you. If you’re a senior who resides in one of the colder regions of the country, this is undoubtedly an option to consider, though. It is usually costlier to have hot water hook up on a bidet. So, you’ll need to decide whether the extra cost is worth it to you. Just bear in mind, during the coldest months of the year, that water can be frigid. Some people find this refreshing or don’t mind a quick spray of cold water, but this is something to consider for your personal preferences. It’s important to be sure you get a bidet with an adjustable setting for the spray, even if nothing else is an option on it. Beyond that, it’s worth considering whether you’d like a front-spray option, the ability to hold the sprayer for more control as in the Aqua Nexis Stainless Steel Sprayer unit, and if you want the sprayer also to offer air drying. If you love the idea of the air drier, you’ll have to spend a bit more on an electric unit. Most individuals expect bidets to be in toilets so a side-mount unit or even a bidet built into an entire seat will work fine. For those who are especially particular about cleanliness, or seniors with lower immune systems, a sprayer mounted on a wall next to the toilet that can be cleaned with a sanitizer wipe daily might be a better bet. However, if you’re confident you want a standard style bidet and don’t want it mounted on your wall, the side mounted on your commode or electric, whole-seat option are probably a better fit. Having a bidet that is build into the seat such as the SmartBidet SB-1000 Electric Bidet can offer a lot of extras such as heated seats. Keep in mind, if you end up disliking the bidet you will need the entire seat taken off again and replaced. So, hanging onto your original seat in storage might be a good backup plan. Prices can vary a great deal when it comes to bidets. The electric, built-in seat options will tend to run in the range of a few hundred dollars. Whereas a sprayer type of bidet and even some more standard, mechanical version will often be around $50 or under. Think about how much use it will get. If you’re likely to use your bidet a few times a day, spending a couple hundred dollars could be well worth the price. However, if you’re probably only going to take advantage of it a couple times a week when you really feel you need it, it’s likely a better idea to save some money. Bidets can be beneficial to aging individuals in several ways. Electric bidets with remotes can offer those with limited mobility far more ease when using the commode, especially when a drying option is available. Eliminating the need to wipe can make a massive difference in the lives of people with mobility issues or for those who use a wheelchair. Even for seniors who have no trouble getting around, a bidet can provide a more thorough clean, added comfort, and help soothe conditions such as hemorrhoids with gentler spray options. If you’ve never tried one, it’s worth giving a bidet a shot.